HAMMER, ROTO LG 30lb max-4"
BOSCH 30LB ROTO/DEMO HAMMER WILL DRILL,CHIP.BREAK CONCRETE DRILL UP TO 4" HOLES WITH CORE BITS, SMALLER WITH IMPACT CARBIDE SPIRAL BITS WITH SPLINE SHANKS. (NOT HEX) STYLE COLLARS FOR CHIPPING/BREAKING. 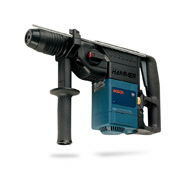 A Dust Collection attachment to use with roto hammers and tank vacuums per OSHA requirements on dry silica dust protection is available and rented separately. * Please call us for any questions on our hammer roto lg 30lb max 4 inch rentals in Portland OR, Gresham OR, Milwaukee OR, and surrounding metro area.